worked in specimens of wood work in varied forms and the lettering was in raised wooden letters. There was no working machinery, but at the sides revolved large fan-like wooden wheels, the spokes of which were formed of varied designs. Next came the R. D. Johnson Milling company, whose wagon was heaping over with sacks and barrels of flour manufactured by the firm. Twelve stalwart employees of the company were perched on top and gave life to the scene. The carriage building firm of Reid and Deihler came next. Mounted on their wagon was a handsome physician’s phaeton, made at their establishment. John McCormick, wagon maker, had three vehicles. Two of them were filled with machinery and products, and the third was a buggy, in which sat Mr. McCormick himself. The small boys were delighted with Mrs. M. Farrell’s exhibit. On her wagon stood two candy makers, who turned out toothsome sweets and tossed them to the crowd. L. H. Young’s heavy wagon bore a handsome array of chairs and sofas. H.U. F. Flurshutz showed some fine upholstery on an elegant set of furniture mounted upon his tastefully decorated vehicle. Gramlich Bros’ broom making display was unique on account of the work in operation. Bainbridge & Co’s wagon bore a large square frame on which were gracefully draped rich woolen and cotton goods. A large sign with suitable legend, was in the center. A prominent feature with the large vat on wheels of the Washington Brewery. It wore a garniture of hops. Dennis Graves, carpenter and builder hit upon the happy idea of a complete model house with French roof. It attracted much attention. 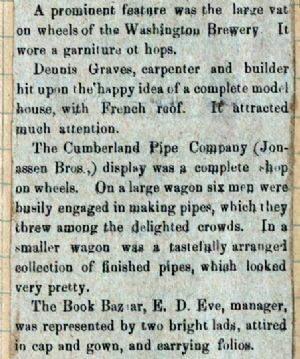 The Cumberland Pipe Company (Jonassen Bros.,) display was a complete shop on wheels. On a large wagon six men were busily engaged in making pipes, which they threw among the delighted crowds. In a smaller wagon was a tastefully arranged collection of finished pipes, which looked very pretty. The Book Bazar, E. D. Eve, manager was represented by two bright lads, attired in cap and gown, and carrying folios. Lavin & Co. hardware, had an extensive and attractive display. Their wagon was one of the largest and it was filled with articles in which they deal, disposed in a variety of ways. In the midst of all stood a wee boy who look exceedingly cute in the costume of “Uncle Sam.” Six mules, caparisoned like war-horses, drew the wagon.